We’re freaking out, and not just because it’s finally Friday. We’re freaking out because Tommy is spinning one of the all-time greatest albums on Friday. On vinyl. Live, on the air. Yep, Missoula’s coolest radio station is about to get a helluva lot cooler. 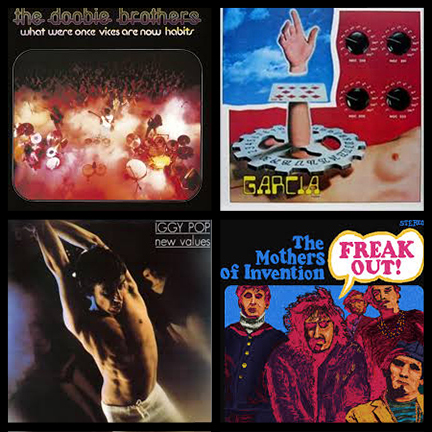 Enjoy some tracks from Freak Out!, the 1966 debut LP of the Frank Zappa-led Mothers of Invention later in the day, courtesy of Tommy. But Craig will start off Vinally Friday with some cuts off The Doobie Brothers’ fourth studio album, What Were Once Vices Are Now Habits. Fun fact: The Doobies‘ first No. 1 hit, “Black Water,” was originally released as a B-side? Alanya will follow up with Jerry Garcia’s first solo effort, 1972’s Garcia. And Robert will feature tracks off Iggy Pop’s New Values. The album was released in 1979 and marked Iggy’s first solo record without any involvement from the late great David Bowie.